The wife of Liberia's former President Charles Taylor has thrown her weight behind Ellen Johnson-Sirleaf in next month's presidential run-off. 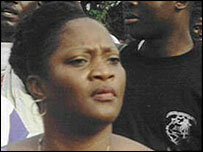 Jewel Taylor was elected to the Senate in general elections this month. Her backing is a surprise as Mr Taylor and Ms Johnson-Sirleaf were bitter rivals. Ms Johnson-Sirleaf will face former international football star George Weah in the second round on 8 November. 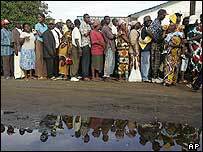 The elections were the first since the end of Liberia's 14-year civil war. Election observers praised their conduct, noting the absence of violence. However, analysts say the real test will be whether the loser of the run-off accepts defeat. It is feared that some of the 100,000 fighters hid some of their weapons rather than hand them over to the UN peacekeeping mission. Mr Weah got 28% in the first round, compared to 20% for Ms Johnson-Sirleaf. Mr Weah has meanwhile secured the support of the fifth-placed candidate in the presidential race, Varney Sherman, according to Mr Weah's spokesman. Sekou Conneh, the leader of the Lurd rebels who drove Mr Taylor into exile, has also backed Mr Weah, along with another former warlord, Prince Johnson. Mr Conneh got just 0.6% of votes cast. The man who came third, Charles Brumskine, has refused to back either candidate. Many young people and ex-combatants back Mr Weah, while the educated elite and women support Ms Johnson-Sirleaf, an economist who used to work with the World bank. Mr Weah, a high-school dropout, says his lack of education would not be a problem if he was elected. He says those with education have only brought corruption and warfare to Liberia. Mr Taylor is in exile in Nigeria after stepping down in August 2003. A UN-backed court in Sierra Leone has indicted him on 17 counts of war crimes and crimes against humanity for allegedly backing Sierra Leone's brutal rebels.